Today was the last day of rapid chess, and the pressure was on for the players to not go drowning into day one of blitz that starts tomorrow. With every game counting double, it was especially important to score today. 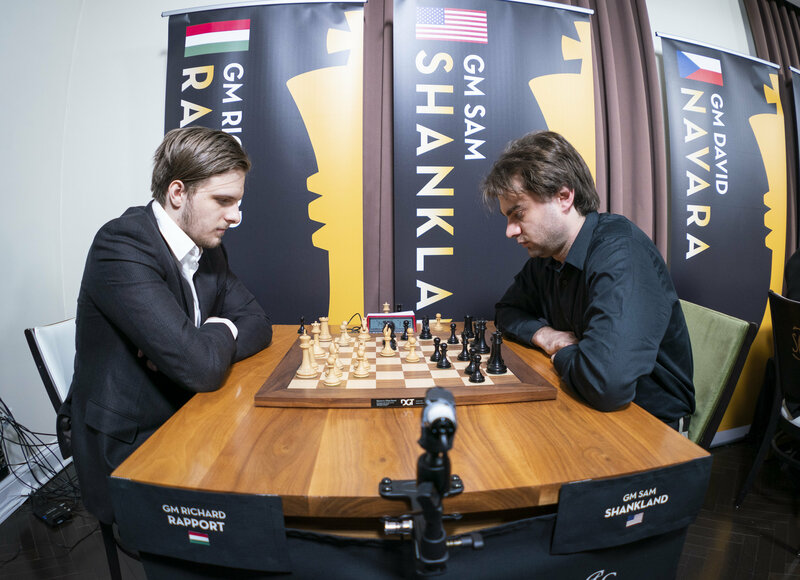 Shankland was trying to keep afloat against Rapport, but to no avail, and Harikrishna, although he didn't lose the day to Caruana, was unable to put a dent in their score difference. 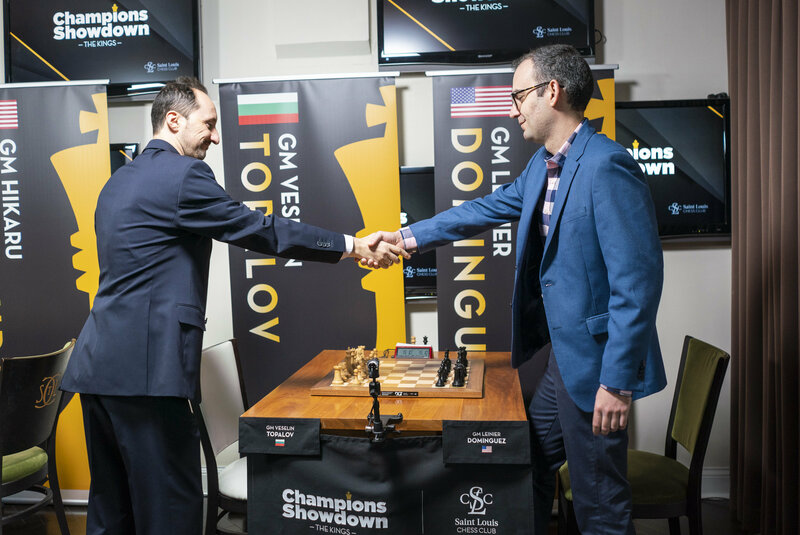 Topalov showed why he is one of the all-time great players of the World in today's rounds against Dominguez, while So's time management keeps Navara in tremendous pressure, which the Czech has so far been unable to withstand. Despite all these amazing matches, it was hard to turn away from today's duels between Duda and Nakamura, who offered absolutely amazing chess! 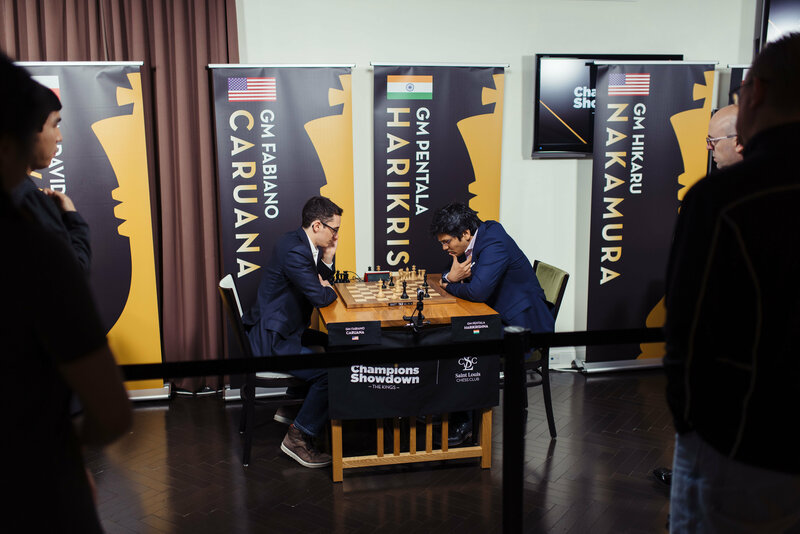 Things started off well for the Indian player, as an unnecessary continuation, as Caruana himself called, landed the American in trouble in the first game and allowed Harikrishna to get his first win! However, Caruana immediately struck back: in an Anti-Berlin structure, Harikrishna sacrificed a piece for many pawns, but the presence of dark squared bishops gave Caruana very strong winning chances. Taking it step by step, Caruana increased his advantage, and despite missing a beautiful checkmate, still took the point home without problems. The day wrapped up with two draws between these titans, with the last game giving both sides chances for an advantage. 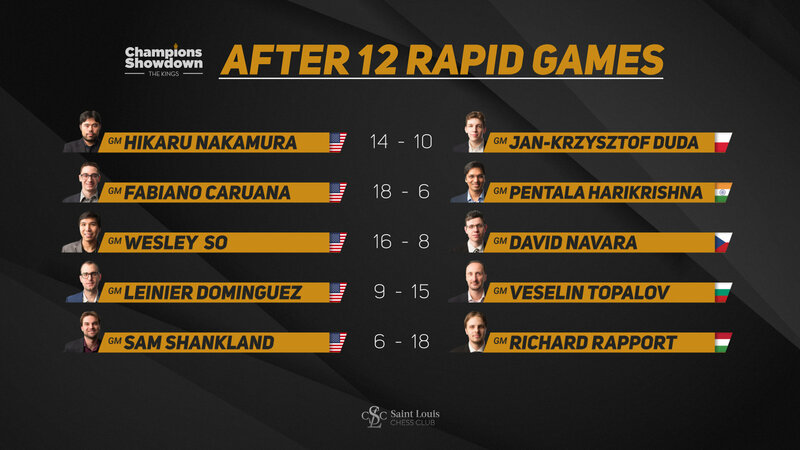 Caruana keeps a commanding lead, 18-6, and jumps to World #2 in the live Rapid Rating list. Fans of Navara were hoping that the Czech player could shorten the gap after having a tough day two of rapid chess yesterday against So, but it was not meant to be. 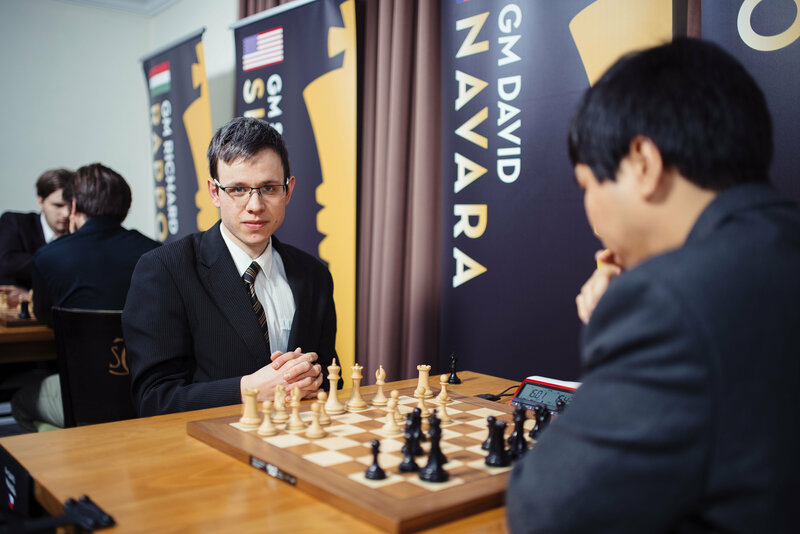 In the first game Navara found himself in an uncomfortable endgame which he was unable to hold, and barely survived in game two. The silver lining for him came in game three as he struck back with a fine victory with the white pieces. This did not last, as So, in another endgame, was able to outplay his opponent and finish the day 16-8. Navara told Maurice Ashley after the game, he is having trouble keeping pace with So, and the American's excellent endgame technique is allowing him to wrap up the games nicely. Duda and Nakamura have certainly stolen the show, currently being the closest match and producing some scintillating chess. The first game had Nakamura on the aggressive side, trying to punish a dubious novelty from the Polish youngster. However, a miscalculation allowed Duda back in the game. 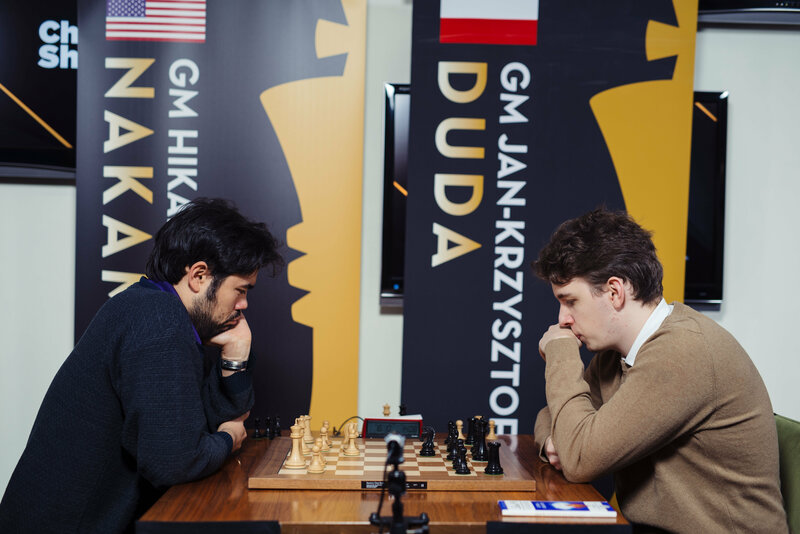 After sacrificing an exchange, Nakamura was unable to push the attack through, and Duda made the material count. Nakamura put pressure on his opponent on game two, only to have Duda defend tenaciously, and just as he was approaching equality, a bad blunder cost the Polish player the game. Today's game three was an absolute spectacle, it had a little of everything! Connected passed pawns, sacrificed pieces, rooks, weak kings, checkmating attacks, blunders, brilliance, just wow! Duda botched up a winning tactic at the end, but the entertainment value of this one was truly something else. Nakamura again with the white pieces was able to dominate the game from the get-go, and after a dubious strategic decision by Duda it was all about the American's activity. Delivering checkmate on the board, Nakamura increases his lead from yesterday. Topalov put a masterclass today against Dominguez, who many expected to be the favorite against the former World Champion. The Bulgarian was on fire, outplaying the newly transferred American grandmaster from basically every position. The last game of the rapid portion between these two players was particularly impressive, as Topalov sacrificed a piece for pawns and was able to march them all the way down the board. Despite entering today on a tied score, Topalov now leads comfortably, and Dominguez will have to prove why he was once able to win the World Blitz championship. For fans of Sam Shankland, the only good news is that the reigning U.S. Champion scored his first victory of the match! Unfortunately Rapport keep stealing the show, winning all the other games. When prompted about the disparity, Shankland told Chirila that he had worked very hard in being able to compete with the best of the best in classical time controls, and that despite his success in that format against the world's elite, he clearly still wasn't at that level in rapid and blitz chess. The Hungarian star leads by a big margin, and Shankland will need to make a miracle comeback in blitz tomorrow to make it alive to the last day. Photos courtesy of Austin & Crystal Fuller, Lennart Ootes, and Spectrum Studios. Additional images and credits can be found on Flickr.